Vatican City State was founded following the signing of the Lateran Pacts between the Holy See and Italy on February 11th 1929. These were ratified on June 7th 1929. Its nature as a sovereign State distinct from the Holy See is universally recognized under international law. The Catholic Church carries out its mission of announcing the truth of the Gospel for the salvation of all humanity and in the service of peace and justice in favour of all peoples, both through the various specific and local Churches spread throughout the world, as well as through its central government. This is made up of the Pope and the Departments that assist him in carrying out his responsibilities towards the universal Church (identified as the Apostolic See or Holy See). The Pope lives in Vatican City where several of the aforementioned Departments are to be found. Vatican City State has the singular characteristic of being an instrument of the independence of the Holy See, and of the Catholic Church, from any earthly power. In a way, it is a sign of the Church’s supernatural character insofar as the structures of Vatican City are reduced to the minimum necessary to guarantee its functions. Vatican City lies just beyond the right bank of the Tiber River on a slight rise, part of the ancient Montes Vaticani (the Vatican Hill), on which several villas were built in pre-Christian times. The Roman Emperor Caligula (37-41AD) had a private circus built here. It appears that many Christians living in Rome during the reign of the Emperor Nero (54-68AD) were martyred in this circus and in the adjoining gardens. St Peter was buried to the north of the circus, in a necropolis that lay beside a secondary road. Between 324 and 326 AD, the Emperor Constantine built a magnificent basilica over the burial site. It was replaced by the present Basilica between the 16th and 17th centuries. Vatican City covers a territory of 0.44 square kilometres, that is 44 hectares (roughly 100 acres). It is partly surrounded by walls and stretches into St Peter’s Square as far as a strip of travertine stone that corresponds with the furthest end of the colonnade. This marks the boundary of the State and the edge of the Square which is normally open to everyone. Even though it is part of Vatican City, the Square is usually patrolled by members of the Italian Police Force. There are five entrances to Vatican City, each of them guarded by the Pontifical Swiss Guards and by the Gendarmes Corps of Vatican City State. The entrance to the Vatican Museums is on Viale Vaticano, not far from Piazza del Risorgimento. Because Vatican City is so small, several Departments and offices belonging to the Holy See are situated in buildings around Rome (in Piazza Pio XII, Via della Conciliazione, Piazza San Calisto, Piazza della Cancelleria and in Piazza di Spagna). According to the Lateran Treaty, these buildings enjoy the same status, recognized by international law, as embassies and foreign diplomatic missions abroad. The areas occupied by these buildings are commonly known as “extraterritorial”. The whole area of Vatican City is under the protection of the Hague Convention of May 14th 1954 regarding the safeguarding of cultural heritage sites in the case of armed conflicts. In 1984, Vatican City was registered as a world cultural and natural heritage site in terms of the UNESCO Convention of November 16th 1972, which guarantees the protection of such sites. Vatican City State is also internationally recognized as a moral, artistic and cultural heritage site that merits respect and protection as a treasure that belongs to the whole of humanity. Even though Vatican City has no direct access to the sea, by virtue of the Barcelona Declaration of 1921, it is allowed to sail its own vessels flying the papal flag. However, the Vatican does not avail itself of this right at this time. 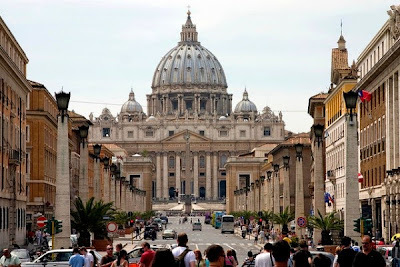 The population of Vatican City is about 800 people, of whom over 450 have Vatican citizenship, while the rest have permission to reside there, either temporarily or permanently, without the benefit of citizenship. About half of the Vatican’s citizens do not live inside Vatican City. Because of their occupations (mostly as diplomatic personnel), they live in different countries around the world. The conferral or loss of citizenship, authorization to live inside Vatican City and formalities for entering the territory, are governed by special regulations issued according to the Lateran Treaty.